Enjoying nature with your dog can be a wonderful way to see things that you may never have noticed--viewing them through the eyes of your dog as he sniffs the bushes, rocks and trees along the path. The problem is that some of those curious sniffs can end badly. Snake bites, sharp rocks and sticks, bug bites and other surprises can await when you venture into the woods. That's why you must always go prepared to deal with the most urgent of matters. The Kurgo first aid kit straps onto your belt or backpack quite easily, and honestly, I hardly knew it was there when this photo was snapped by a friend. Despite the 50 pieces of first aid necessities inside, it weighs almost nothing. 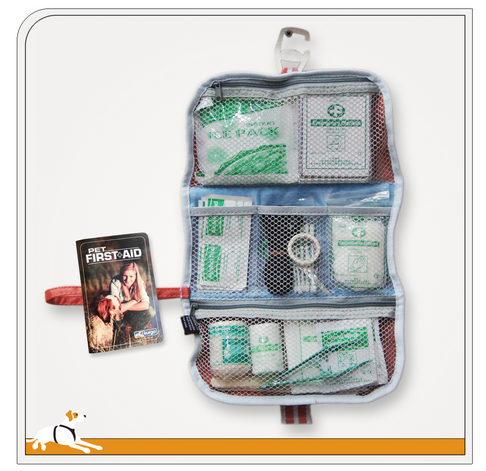 You can read more about this at my first aid kit review. Now it's time to get on with the fun. I'm going to be giving away 5 of these handy pet first aid kits, to assure that at least a few of you will be prepared to head off with proper supplies. If you're more of a sure-thing sort, you can purchase a kit at the Kurgo website, where they also sell refills when you use up supplies. 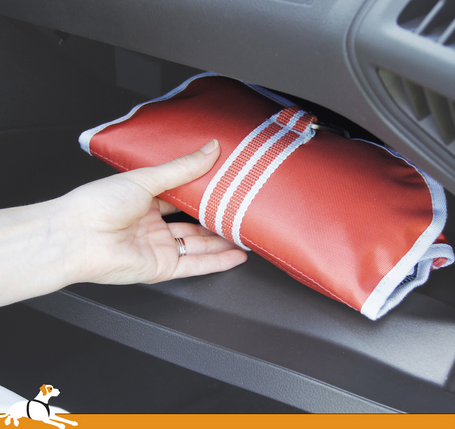 Keep One In Your Car Too! As you use the Rafflecopter entry form, keep in mind that giveaways are supposed to be fun. Enter using only those methods you find enjoyable, and pace yourself. Finally, be aware that the entry form is a bit persnickety sometimes. If it's hiding in the woods and out of sight, simply click on the post title to get it to reappear in the meadow to play. Entries will be open through midnight on Thursday, October 16. I'll announce the winners on Friday, October 17. Good luck!